Every April 4, I play U2’s “Pride (In the Name of Love),” to commemorate Dr. Martin Luther King Jr. The song runs through a series of historical figures who paid deep sacrifices, including Jesus, and ends recounting King’s assassination in Memphis on April 4, 1968. At the time of his death, King was making common cause with poor black sanitation workers striking for better pay, and was planning a protest march later in the year in Washington, D.C., for his Poor People’s Campaign. As I played “Pride” this week, I wondered what King might make of our country had he lived. Today, according to the Associated Press, rates of incarceration for African Americans across the country are worse than in 1968. Our public schools are experiencing a wave of resegregation. And gains in home ownership African Americans made after the passage of the Fair Housing Act in 1968 eroded over the past 15 years, according to a new report. Here in New Mexico, poor children of color continue to lag behind Anglo youth in getting high school diplomas while the state drags the bottom of the child well-being rankings of the annual Kids Count report from the Annie E. Casey Foundation. 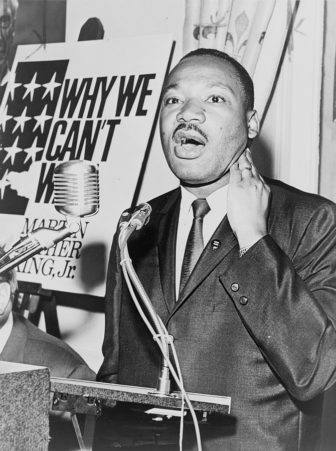 When many Americans think of King, they think of his “I Have a Dream” speech in 1963. But make no mistake, King was a radical visionary. King spoke repeatedly of America’s failure to live up to its ideals, particularly in the realm of systemic racism. Systems and structures are much on my mind this week, the 50th anniversary of Dr. King’s assassination. In New Mexico, we await a court ruling in a lawsuit that contends the state’s education department isn’t meeting its constitutional obligation to sufficiently educate all children, especially low-income, Native American and English language learners. And our state experienced a recent political flare up over charges of “systemic and institutional racism” made by early childhood advocate Allen Sanchez. Sanchez, who supports tapping a state fund to help pay for early childhood programs, said “an element of racism” had doomed the legislative measure this year. He later explained he was talking about “systemic and institutional racism.” His explanation didn’t stop dozens of lawmakers from describing the comment as a “direct attack on the character” of legislators. Racism is a tricky word for many Americans; in my experience in particular, for white Americans. It’s explosive. It offends. They hear the word, whether preceded by systemic or institutional, and they hear “you’re prejudiced” based on skin color, which is not the meaning of systemic racism. One of my first memories as a journalist was reading the Pulitzer-winning series in 1988 by the Atlanta Journal-Constitution — The Color of Money — that examined redlining. That systemic racism has contributed to a persistent “wealth gap” in the U.S. between whites and most other racial groups. The easiest way to transfer wealth from one generation to the next is through home ownership. But because of redlining and other discriminatory practices over the past century, blacks and other groups haven’t been able to buy homes at the same rate as whites, limiting their wealth accumulation across generations. Here in New Mexico, Spanish land grant communities all over New Mexico lost hundreds of thousands of acres to the U.S. federal government over a span of several decades, according to UCLA law professor Laura Gomez in her book Manifest Destinies. Fifty years after King’s death, a recent study, “Healing our Divided Society: Investing in America Fifty Years After the Kerner Report,” reminds us of how much work we have left to do. “Racial and ethnic inequality is growing worse. We’re resegregating our housing and schools again,” the Associated Press quoted former U.S. Sen. Fred Harris of Oklahoma, who served on the original Kerner Commission. It seems like we have much work remaining to do to live into the dream Dr. King called us to live into collectively.